Tourism student and travel enthusiast. You can find her hiking a mountain or enjoying a cup of coffee in downtown Reykjavik. A big fan of cats and breakfast food. No matter whether it is your first time in Iceland or you’ve been here multiple times - the destinations on the Golden Circle look different in each season, and there are always new locations to discover. To make your experience even better, we collected some little-known-facts about the three main attractions of the Golden Circle. You can find this beauty just about an hour away from the busy capital area. With remarkable geological and historical significance, this park is one of the must-sees of Iceland. 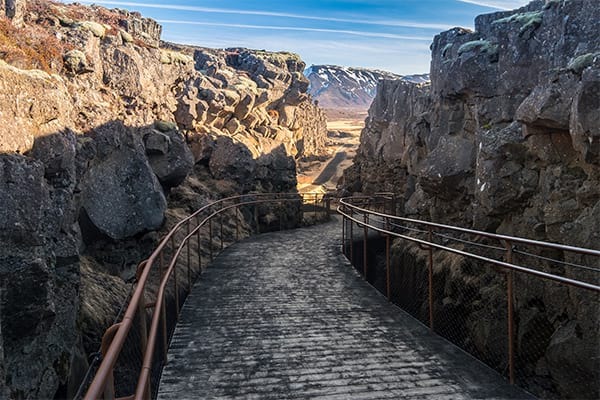 Thingvellir is bigger than one might think: the popular area with the old parliament, church, Öxarárfoss waterfall and Almannagjá canyon is only a small fragment of it. You can get lost here for hours, be it a nice easy hike on one of the paths or a stroll around the sparkly blue Thingvallavatn lake. ...If you can spread your legs 7 km wide. This is the distance between the North-American and Eurasian tectonic plates, that created the rift valley that you can uniquely see above sea level in the national park. The middle part is No Man’s Land, and the rift between the two continents grows 2 cm each year. The Icelandic Parliament, the Althingi was founded in 930, one of the oldest democratic establishments in the world. As a celebration of the anniversary of Icelands 1000th birthday, the country declared Thingvellir a national park. Understandably, they were expecting a lot of important foreign personnel to the party, but compared to today’s hotel-infrastructure, in 1930, the country did not have much to offer to its guests. An Icelandic wrestler, who made a fortune in America, Jóhannes Jósefsson came to the rescue, and offered a hefty sum to help build the first luxury accommodation in the country, the still-operating Hotel Borg in downtown Reykjavik. The stories about the national park are not all glorious. Close to the Öxaráfoss waterfall, you can find the Drekkingarhylur-pool. This pool has been infamous for hosting the execution by drowning of several women who had been accused of sins of adultery or child murder. The citizens who were found guilty of witchcraft were burnt at stake at the Brennugjá-gorge. In the 17th century witch hunts, out of the 23 people executed, only 2 were female, which went against the European and American ‘trends’, where witchcraft was mostly associated with women. With its 85 km2s it’s slightly bigger than Manhattan. The lake, which is a popular among fishermen for its Arctic charr has an impressive depth of 114 m as well - as a comparison, the Hallgrimskirkja church is 74 m tall. After leaving the national park and driving an hour towards the middle of the country, we will find ourselves on the Haukadalur geothermal field with its geysers and hot springs. The Great Geysir has been dormant for more than a hundred years, but its little sibling Strokkur is still active. Make sure to always follow the marked path when you’re in the area - boiling hot water might gush out from the earth at any time. 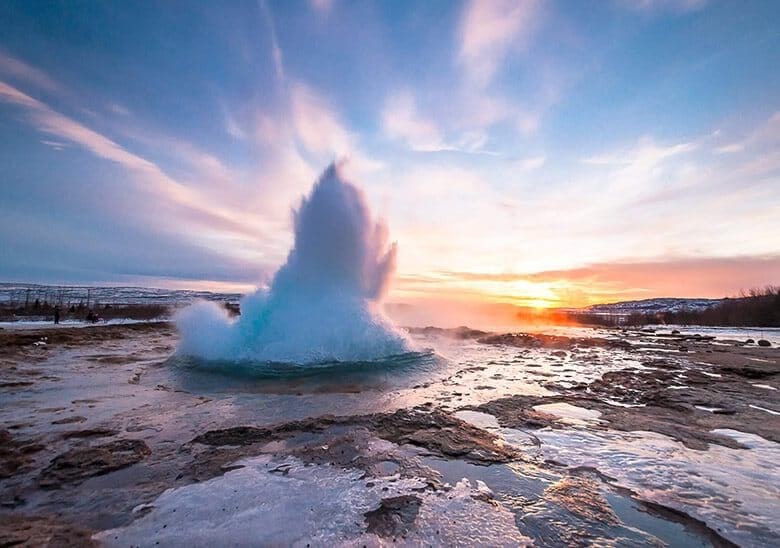 The word ‘geyser’ comes from the Icelandic verb, ‘geysa’, which means ‘to gush’. The English word originates from Geysir, which is the name of the first geyser that was known in Europe. ...As long as the 13th century, from when the first ever written records of the the Great Geysir have been found. 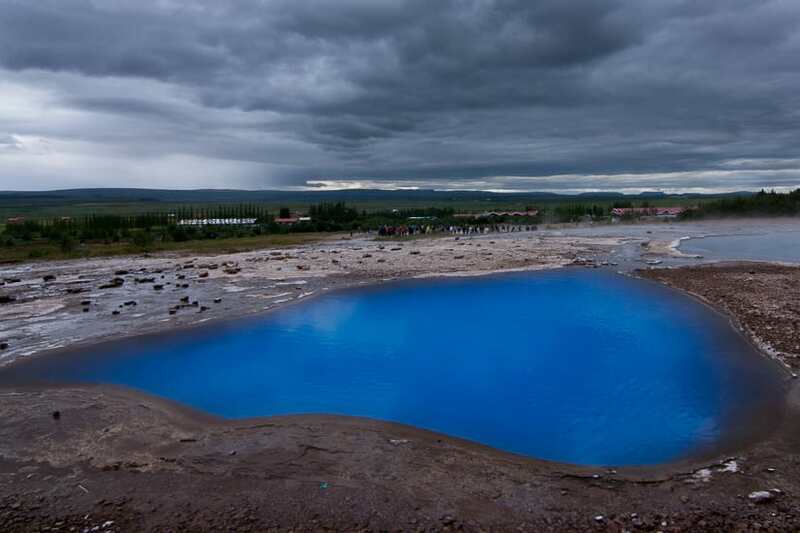 Although there has been some attempts to wake up the Great Geysir with soap, it has been dormant for a while now. Its smaller cousin, Strokkur, is still spewing every 10 minutes or so..
Its eruptions can be as high as 40 meters, but usually they are about 20 meters due to the frequency of the eruptions. Strokkur stopped working after an earthquake blocked its conduit but luckily it was cleaned out and brought back to life in 1963. 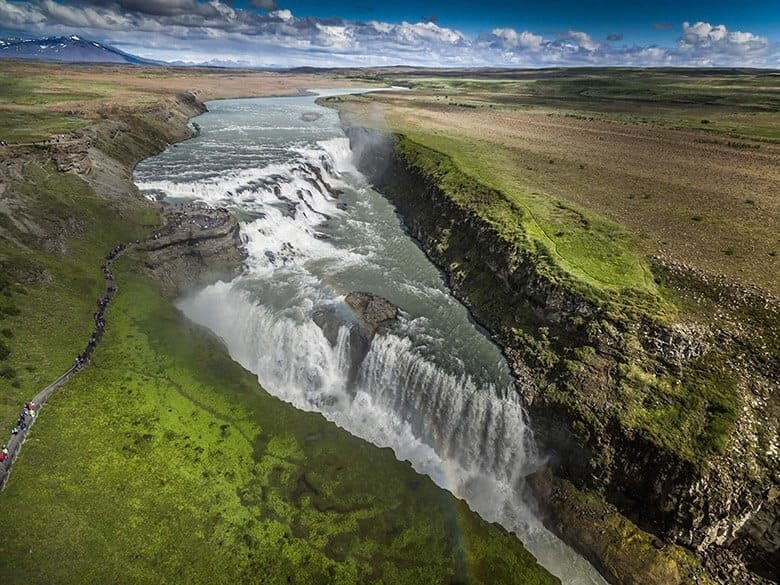 One of Iceland’s iconic waterfalls, the Gullfoss is just about 10 minutes of driving away from Geysir. The name Gullfoss translates to ‘Golden Waterfall’, which refers to the golden colour of the water it takes on a sunny day. The river’s name, Hvítá, can be translated as: the White River. The name comes from the white-ish colour of the water which is the result of the different minerals originating from the Langjökull glacier. In 1907, an English businessman, Howells has seen the opportunity of a lifetime in buying the Gullfoss waterfall, harnessing its great energy to produce electricity. 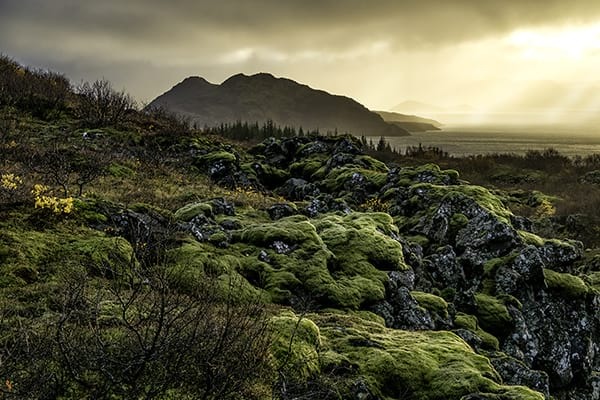 The land belonged to Tómas Tómasson, whose daughter Sigríður was very fond of this natural treasure and took it on herself to protect it against the foreign investors. She walked all the way Reykjavik to talk about her case, and threatened to throw herself into the waterfall if everything fails. With the help of lawyer Sveinn Björnsson, they managed to annul the contract and the waterfall was saved by Sigríður’s bravery and resistance. Today, Gullfoss belongs to the people of Iceland and is one of the most frequently visited landmarks of the whole country. No wonder they wanted to build a power plant on it. The valley of the waterfall gets 25 cm longer each year due to erosion. For the lovers of numbers: the usual water flow over Gullfoss is 109 cubic metres per second with the heaviest water flow ever recorded being 2000 cubic metres per second. If you have some time for a small detour, make sure to visit this volcanic crater lake. 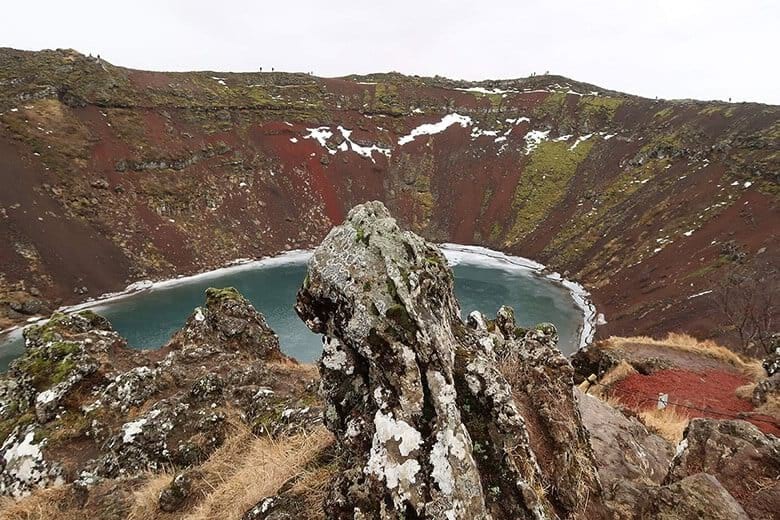 The caldera is typical ‘volcano-like’, which is due to the fact that with its 3000 years, Kerið counts as a young caldera. They are so good that there have been concerts performed on the lake. A boat on the lake served as a stage, while the audience was sitting and enjoying the music - and the scenery - on the caldera around the lake. Sounds lovely, doesn’t it?